3.5.2 Session "Wiki and Language"
3.5.4 Session "Knowledge Representation and Learning"
3.5.5 Session "Models, Architecture, and Other Vexations"
3.5.6 Session "Wiki Analysis, Growth, and Trust"
WikiSym 2008 offers a rigorously reviewed research paper track, as well as plenty of space for practitioner reports, workshops, panels, demonstrations, tutorials, and informal but lively OpenSpace and WikiFest sessions. 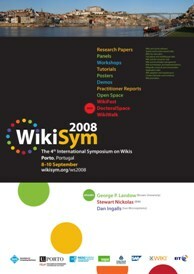 In addition, WikiSym 2008 will have a set of invited talks. For the first time this year, there will be a DoctoralSpace, an interactive forum for doctoral students to provide guidance on their doctoral work, a WikiFest and a WikiWalk. The social program will help participants know more about each others and Porto city. Take advantage also of the other events happening in Porto, before WikiSym 2008! Keynote "When a Wiki is not a Wiki: Twenty Years of the Victorian Web"
Invited Talk "The Lively Kernel: A Wiki of Active Objects"
Special Event "Porto by the Douro River"
Keynote "Application Wikis to Mashup Makers to Next Generation Mashups"
See you in WikiSym 2009! OpenSpace will take place throughout WikiSym 2008, providing a place for all of WikiSym to be together to start and end each day. 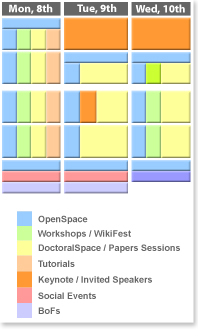 The OpenSpace schedule will be written by the participants on the first day, and modified throughout, as new topics emerge, just like a wiki. Notes from the sessions should be recorded at OpenSpace. Some possible topics include: WikiMetrics and Wikipedia Studies, Wiki Law, Semantic Wiki, Wikis in Education, Application Wikis. Bring your ideas! As a post-conference event, WikiWalk will let you walk and talk about wikis and the city of Porto, while visiting some of the historical streets and places of Porto. It will be an open event that all interested on joining will be welcome! Twenty papers were accepted for the conference. Session "Knowledge Representation and Learning"
Session "Models, Architecture, and Other Vexations"
Session "Wiki Analysis, Growth, and Trust"
Quantitative Analysis and Characterization of Wikipedia Requests - Antonio J. Reinoso. Any of the poster presenters also has the option to demo to their audience. Here follows a few demos that are not associated with posters. ShyWiki - A Spatial Hypertext Wiki - Carlos Solís. How to get it widely used throughout your organization, project, or group. For more information on WikiFest, please see WikiFest. "The primary duty of the program committee is to ensure the integrity and the reliability of the research literature. People who attend the conference, or who consult its Proceedings in the future, must be confident that the results reported here are honest, accurate, and may be relied upon." "This differs from the duty of a commercial conference like TED, which must consider first what might best attract and entertain its customers. It differs, too, from conferences that cultivate movements, such as SEED or An Event Apart, where the program seeks to advance a professional goal, or where the intent is to train people in the techniques that have made some of their colleagues particularly successful." This page was last modified 08:16, 10 September 2008.